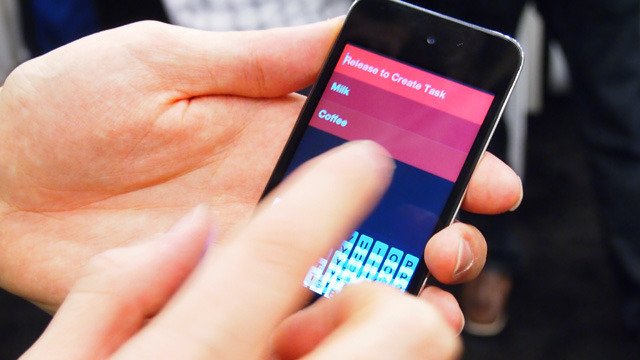 More on the todo app our student Michael told us about, with the cool ui. Turns out the designer involved works at iconfactory in Greensboro. If managing your to-do lists is taking up more time and effort than you spend actually getting things done, a new iPhone app coming from developer Phill Ryu, designer David Lanham, and publisher Realmac Software might be the perfect solution. Tossing most iPhone UI conventions out the window along with any religious adherence to GTD principles, the upcoming Clear app is designed to eliminate the friction and complexity of adhering to systems like GTD and be as easy to use as a paper list. We were able to meet up with the team at the 2012 Macworld|iWorld to check out the offerings. Clear has no standard navigation bar at the top or tab bar at the bottom—common iPhone UI elements. Instead, the app is stripped down to the bare minimum, with a rectangular strip for each list item. Pull the list down from the top to add another item. Swipe right to mark the item completed. Swipe left to delete the item from your list. Pinch to access a list of lists—you could keep a shopping list, a list of errands, and a list of projects, for example.